HarshMet HGS-1043, is designed to quickly seal 1/2" jumper cable to antenna, TMA or RRU connection for cellular site. Compatible for 1/2" flexible and super flexible cable. The connector is 4.3-10 MINI DIN connector. 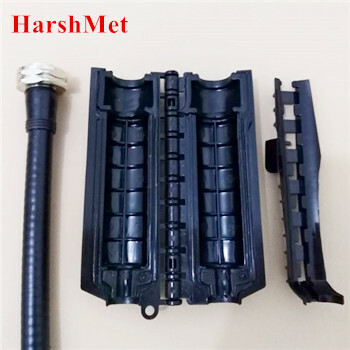 HarshMet HGS-12A is typically used for sealing of classic 1/2" DIN 7/16 connectors beneath wireless cell sites antennas or RRU(Radio Remote Unit) etc. Compared to conventional tapes and mastics, HGS-12A is a kind of quicker, easier and reusable weatherproofing solution, which helps our clients save time and money. 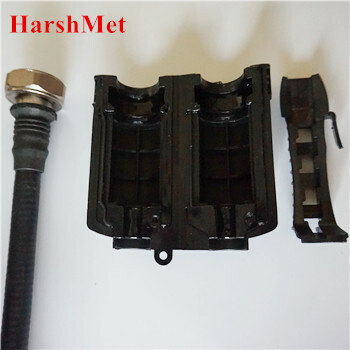 HarshMet CST-M series is a kind of special cold shrink design with built-in mastic inside the rubber tube, and this kind of design means a tighter sealing compared to the traditional ones. CST series cold shrink tubings feature very high shrink ratio, excellent weather performance, electrical and mechanical properties, making them a perfect solution for all kinds of coax cables and RF coax connectors beneath BTS equipment including antenna or RRU for weather protection purpose. Compared to traditional tapes &mastics, CPS series is a kind of quicker, easier and more cost-effective weatherproofing kit, which helps our clients save time, labor and money. HarshMet HGS-1278, is designed to quickly seal 1/2" jumper cable to 7/8" feeder cable connection for cellular site. Compatible for 1/2" flexible and super flexible cable. The connector is 7/16 DIN , N type or 4.3-10 connectors. HarshMet HGS-12AS, is designed to quickly seal 1/2" jumper cable to antenna, TMA or RRU connection for cellular site. Compatible for 1/2" flexible and super flexible cable. The connector is 7/16 DIN connector. CS-EC series Cold Shrink End Caps environmentally seal and mechanically protect exposed cable ends using no tools, mastics or tapes. They are close-ended, tubular EPDM rubber sleeves that are factory expanded and loaded onto a removable core. When positioned over the end of a cable, or other cylindrical object, the core is removed to provide a reliable seal that protects your cable ends from environmental damage. They are easily installed and cleanly removable. Whether in transit from the manufacturer, stored in the cable yard, or in process in a trench, your cable ends are protected from exposure to moisture, contamination and corrosion. HarshMet SFT-40 self fusing silicone rubber tape is a high temperature and arc-and-track resistant tape composed of self fusing, inorganic silicone rubber and easy-tear and easy-strip liner. SFT-40 has wide temperature tolerance of -50 to 250 . It can be applied through 15kV for insulation and sealing for cable and reenter connections.